My family has owned a house directly behind the cemetery for many years. From their backyard you can see nothing but headstones stretching for miles. After living their for a few months you get use to it and it becomes no big deal. But one thing that I will never get used to is the glowing orbs in the cemetery at night. This does not happen every night, but some nights there are orbs that seem to be hovering on top of random head stones. I am not just talking about ones off in the distance, there are even ones as close to fifteen feet from the backyard fence. They are clearly not candles or man made lights, just round yellow and white orbs. 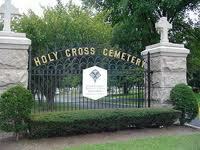 It is also common to see shadow figures, and even hear voices at night coming from the cemetery. I have also witnessed black apparitions on the surrounding streets. Also note that I have captured many unexplained EVP's from the backyard, and in the cemetery itself. I wouldn't say these are angry spirits, but the whole area is very active probably due to the vast size of this place. I went to the 2nd floor of the original mausoleum building and on my way out I took the elevator along with my wife. There was another woman in the elevator as well. I stood to the far right side of the elevator about a foot from the side hand rail. As the elevator began to head down to the first floor, something or someone was tugging on the right side of my jacket. At first I thought I had caught my jacket on the side rail, but when I looked down, I was clearly a least a foot away from it. The entire way down to the first floor, I felt the strong tug. When the elevator door opened, I grabbed my wife and bolted out of the elevator. There was definitely something in the elevator with us. I grew up across the street from the cemetary. My parents have owned the house there since 1968. The cemetary was my playground as a child. I've been in there at night. I've never seen anything weird and never saw orbs. I lived across the street from it from birth until I was 21 and never saw anything. I live behind the same cemetary. What do these orbs look like? i would love to visit there after dark.